There was a time, not many years ago, when it looked like Bradford would be keeping the massive hole left there after the frenzied demolition of the bottom part of town. The plan was to build a new shopping centre, but the financial crash put paid to that. The space was left as rubble for years, and then part of it became a rather forlorn and depressing temporary park. It was a bleak time, the vast wasteland symbolising an existential emptiness that many felt the city held at its core. But the shiny new shopping centre was built, and it brought with it a lot of associated development, a lot of new names and faces, and things started to look … possible. Bradford has a long way to go – the opposite end of town is suffering enormously from the gravitational pull of The Broadway, but the impact that this new space has had on the city has been enormous. So, here we are, right across from the spot that the old Wimpy bar used to be back in the day, sat in a posh burger bar, an outpost of Americana in a windy northern high street, shadowed by the gothic majesty of Lockwood & Mawson’s Victorian Wool Exchange, flanked by a sleek new shopping centre, and backing onto yet another demolition site that will ultimately become a cinema. It all feels right, and fits together well. And what a burger bar. Five Guys is a chain – let’s get this out of the way first. It’s a chain of burger bars originating from Virginia with over a thousand restaurants in the US, and about sixty or so in Britain. It’s expanding fast, and is emerging as a serious competitor for McDonald’s, and having eaten their bacon double cheeseburger with fried onion, lettuce, tomato and gherkins, chosen from a range of about a dozen toppings, I can understand why. This is a fast food place that’s content to do things very well, even if that means it takes a little longer. All the normal fast food trappings are there – food wrapped in a takeaway bag, self-service drinks, and the rest, with the big exception that you have to wait for your food to be actually cooked, using ingredients freshly prepped that day. It makes a huge difference, mainly because none of it is automated … it’s cooked when the bloke doing the cooking says its cooked, not when the automated timer goes off. That results in burgers of the best quality I’ve ever seen come out of a fast food kitchen. The other part of any serious burger equation is chips. Five Guys’ chips are hand cut daily from local potatoes … it’s great to know the provenance of your food, even if it turns out that your particular potatoes came from (the HORROR) Lancashire. Chips arrive in huge portions, with far too much salt, quite correctly. This comes at a price, of course. 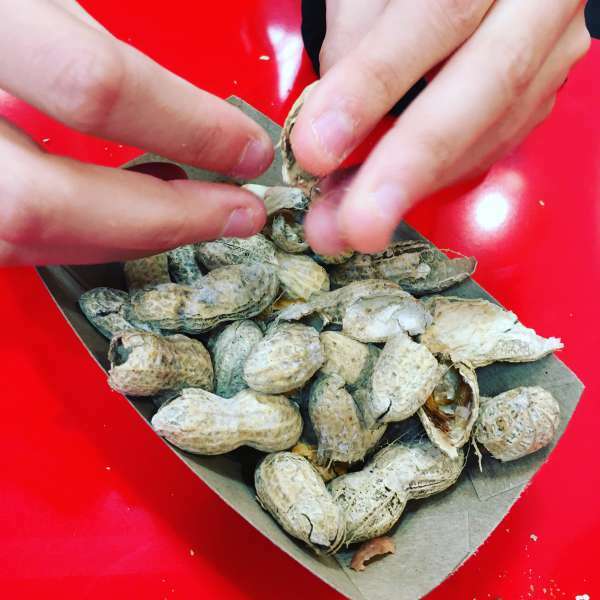 Five Guys isn’t exactly cheap, with four burgers, chips and a couple of drinks weighing in at over £45, but the unlimited complimentary salted monkey nuts made it feel better value and filled that important gap between order and food very well. Extremely good food, very smart restaurants, snappy, efficient service, great chips and free monkey nuts that explode everywhere and keep the kids entertained while they wait. I agree with the ‘great burgers, good chips etc.’ but felt that the burger could be served in something better than the sort of soggy bun you get from the world’s biggest but un-nameable here chain. I also think it is frankly overpriced. At over 17 squids for a burger, chips and shake I suspect that it will lose out to others cheaper chains in Bradford.